When you are just getting started with investing in rental property, it can be overwhelming to choose what type of property you should invest in. You're questioning cost and maintenance. You're thinking about location and potential tenants. Needless to say, there is a lot on your mind. In this episode, Kirk and I break down the two most popular types of properties that newbie investors start with: single family vs. multi-family. We aim to share with you what exactly these properties are and hope to clarify which one might be best for you. We talk about the pros and cons of both types of properties and things you should be considering when it comes time to actually run numbers on to calculate potential returns. 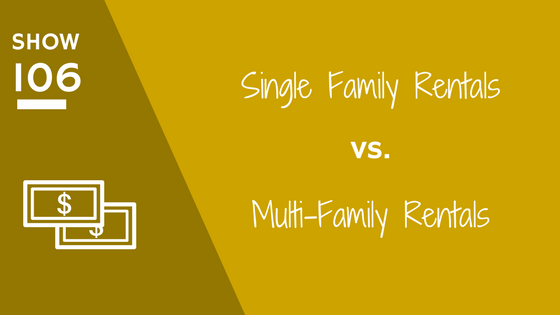 There are a variety of things that differ between the way you analyze a single family vs. a multi-family and we help break that down for you. All in all, either property type is a great choice for getting started. It all comes down to where you are in your life at this moment, how much you have to spend and the type of inventory available to you where you plan to invest.